Tonight's sunset ... I was hoping to drive to a tree silhouette but couldn't risk losing the colour so had to settle for a solitary barn. Striking sunset, love the silhouette. @gmonty Thank you very much! i like that there is still some detail in the barn, instead of blank black.. love the fiery sky with the clouds seeming to be rushing madly around.. Beautifully captured and more than worth jumping into the car.. Incredible sunset! The colours are amazing! Oh my gosh - this is amazing! Love those streaming red clouds and the way they take up 2/3 of the photo. The silhouette of the barn is perfect. Fav! Agree with all the above. This is suberb! Fav!! Wow, that flaming sky is fantastic! Fabulous sky, now following your project. 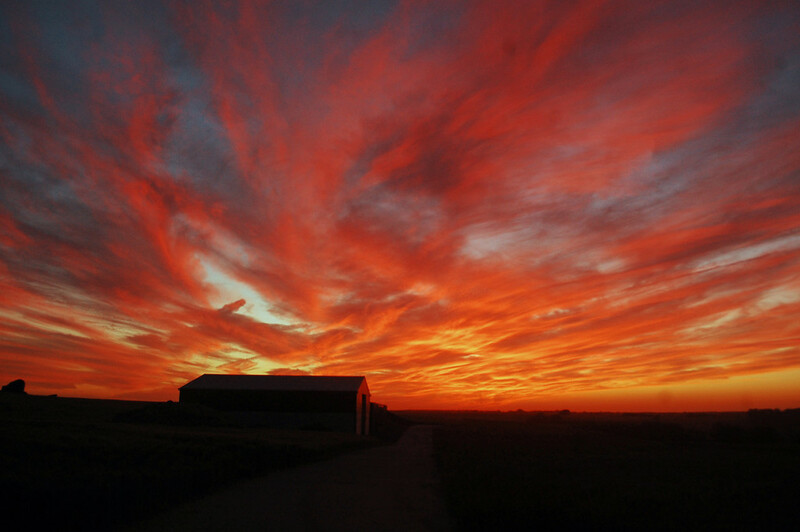 Absolutely stunning, a fire in the sky! @fbailey Exactly how 365 has affected me! I don't take these beautiful moments for granted. They are the beauties of nature than need to be celebrated. Life is a miracle. That is some wild sky!! amazing. @ziggy77 @lucon @dkbarnett @bigmxx Thanks very much - this was such a fluke, I nearly missed the whole show. Amazing, stunting sky And a beautiful capture of it. @caitnessa @pyrrhula @suesouthwood Thanks so much, I was delighted I managed to get a picture of this before it disappeared over the horizon. I doubt I shall see another like this for quite some time. So pleased you liked it too. Fabulous! Congratulations on this making it to the Top Twenty! FAV! @skipt07 Thank you so much for the fav and letting me know, I had no idea. You have just made my evening/weekend!! Just gorgeous! Fav and congrats on the TT!